In Keeper of the Grail, Michigan native (yay!) Michael P. Spradlin offers the first installment of what promises to be a fabulous trilogy. I love epic stories, and the Middle Ages is one of my favorite periods of history. Throw in a little mystery, a hint of Robin Hood, a knight and a Crusade and you have the makings of a winner in my opinion. Young Tristan grew up in a monastery with no idea of his background. When a regiment of Templar knights seeks lodging with the monks, he suddenly finds himself employed as the squire of Sir Thomas, second-in-command. His duties take him to the Holy Land, fighting in the Crusades under King Richard. But when the king’s forces are overrun, Tristan gains an even weightier duty. He must carry the Knights’ greatest secret–the Holy Grail–to safety. But Tristan has made a dangerous enemy. An enemy who seems to know something of Tristan’s past. An enemy who will stop at nothing to steal the Grail. When I left Tristan, he had just been swept overboard. I can’t leave him there. The story continues in Trail of Fate and Orphan of Destiny. I’ve added both to my must-read list. 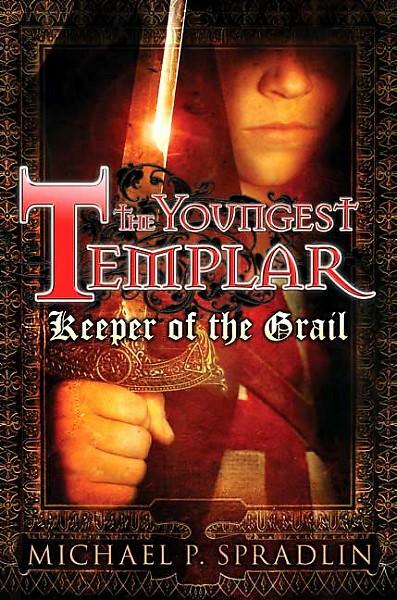 While The Youngest Templar series isn’t stand out amazing, it’s clean and solidly written. I recommend it to middle readers and anyone else who loves fiction set in the Middle Ages. Read my reviews of book two, Trail of Fate and book three, Orphan of Destiny. Next Indie Endeavors, Part 7: Why Publish ebooks on Smashwords? Great review. I’ll have to look into the series. Thanks! I like the Middle Ages — and anything that has to do with the Holy Grail. Sounds like a fast-moving series for MG readers. Pillars of the Earth is a favorite book, and I loved the movie. Great review. The Middle Ages fascinate me, too. Pillars of the Earth is new to me. I’ll check it out! It’s a huge adult book by Ken Follett. It’s about the building of a huge cathedral. I love the DVD, as they did an excellent job with the movie — Oprah was involved some how. Ah, then I probably won’t read it this year. Once I finish writing my current novel, I have to get caught up on my middle grade list, lol! But I bet I could squeeze in a DVD! This series has done well in my library. My daughter loved Pillars of Earth but it was HUGE. I didn’t know there was a movie! Wow, Ms. Yingling, you blog is pretty cool! And your reading goal very ambitious. I wish I could read that many books in a year. Once I finish the novel I’m writing, I’ll probably read about as many books in the remaining year as you’ve read in two months. Robin Hood rocks! This is a great “boy book,” Erik.